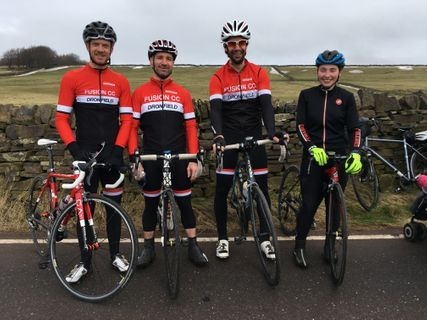 "pay your subs and join our club"
Five of our members raced the Magnificent 7 cycle race on 24th March, as part of the Sheffield Outdoor City Weekend. Click here to find out more about the event and the performance of Dan, Darren H, Darren M, Chris and Abbie. Fantastic performances from all riders including two individual hill wins for Darren helping him to get 2nd overall in the Vets category with Abbie securing 3rd place in the female category. Chapeau to you all! The event comprised of 134 competitors racing up seven steep Sheffield hills to gain points on each before riding leisurely in-between them. The early spring weather was very kind with bright sunshine and a gentle breeze allowing riders to enjoy the views over the outdoor city. 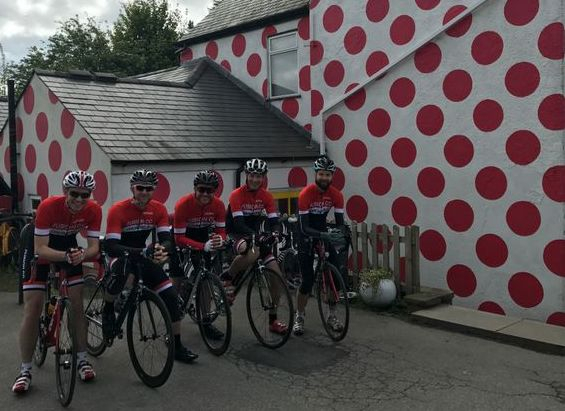 The total route climbed 3,200ft around Sheffield and finished with a handicapped bonus climb on the Tour de France KOM point on the Cote de Bradfield. To see full results click here. The performance of our members has given fantastic coverage for our club on various media platforms including GCN and You Tube. Last Sunday saw the Mansfield Road Club "Big Red Ride" over a distance of 60 miles on a route around Nottinghamshire. This turned out to be a very well organised event with a great HQ and lots of information provided about the routes from printed maps, GPX routes and QR codes for a direct link to strava. The format for the ride was everybody starts at the same time and the first one back has the quickest time. It was great to see local pro Adam Kenway (Vitus Cycling) riding and chatting to us all. It was just a shame he wanted to get back to the HQ before it started raining! This led to a constant 24mph average speed which contributed to dropping many riders along the way. A great ride following the Tommy Simpson the week before and a good way to know if you are race ready! 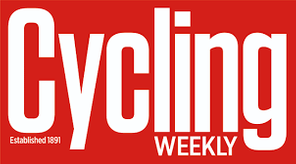 A few months ago the club was joined by Simon Warren and a photographer from Cycling Weekly as we are to be featured on the magazines club ride page. 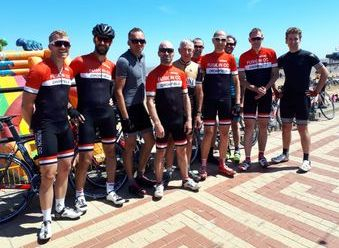 Hopefully all members enjoyed the ride and the chance to speak about why cyclings important to them and why our club is the one to be a member of. 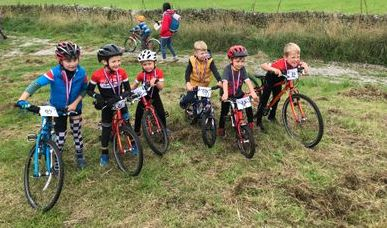 Sunday 28th October saw the "Nationals" being held at Stocksbridge on Pea Royd Lane. Sunday 6th October saw the 88th edition of this fantastic event with three riders representing our club. 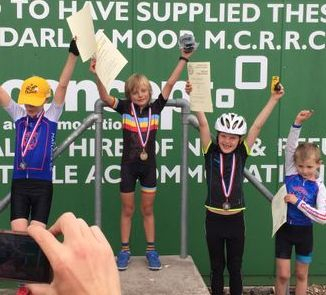 Sunday 22nd July saw the British Schools Championships visit the Darley Moor circuit for a time trial and road race event. Taking part was Ollie Coefield. For Ollie it turns out big wheels are pretty important for TT’s and Circuit Races!! 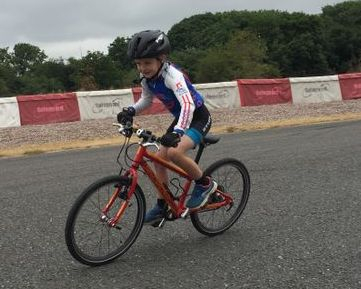 He had a steep learning curve being the youngest and on the smallest wheels, but nearly managed to get past someone on the last bend of the circuit race- 1 more lap and he’d have had him!! It certainly looks like good fun though. This years ride to Cleethorpes once again turned out to be eventful due to an incident for George with a "hole in the road" and a puncture on the way home. Well Done to all riders who rode in high temperatures. We all enjoyed the high mileage, quick average speed and of course "Fish and Chips". Were you one of the 2 million spectators who lined the road at some point over the four days to watch the Tour de Yorkshire? Inspired by what you saw? If so and you fancy a ride with a local club around the Peak District then take a look at our website for more details of how you could make it happen. 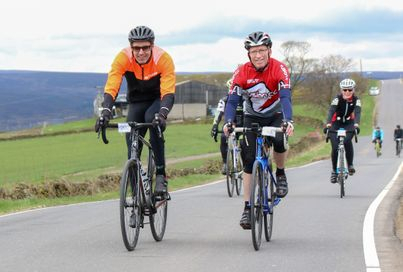 On Sunday 29th April Antony Walker and Graham Coe took part in the Battle of Bradfield sportive which involved 6,000 feet of climbing during the 39 mile ride. 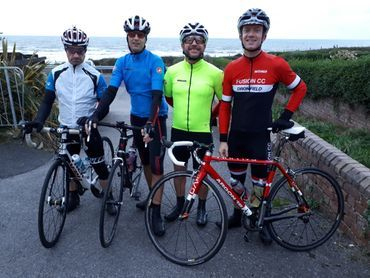 Four of our members raced the Magnificent 7 cycle race on 11th March, as part of the Sheffield Outdoor City Weekend. Click here to find out more about the event and the performance of Dan, Darren H, Darren M and Abbie. Two of the four were involved in the prize presentations! 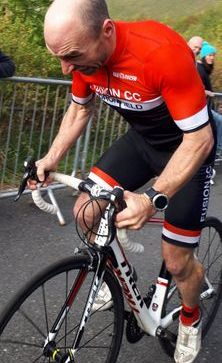 The event comprised of 130 competitors racing up seven steep Sheffield hills to gain points on each before riding leisurely in-between them. The last Sunday of February can only mean one thing. The Tom Simpson memorial ride taking in 55 miles of flat roads. 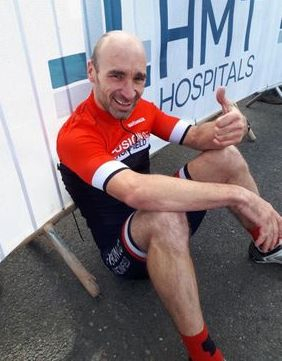 For a small donation towards the fund for the upkeep of his memorial stone in Harworth where Simpson was born as well and his stone on Mont Ventoux, you are given the opportunity to pretend you are a pro rider and aim for a 22mph+ average speed. This year over 500 riders took part on a bitter cold but sunny dry around Nottinghamshire, Lincolnshire and South Yorkshire. 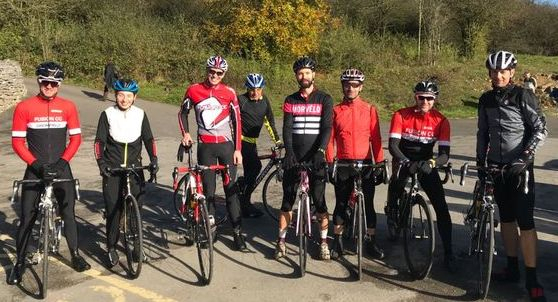 Its a fantastic morning giving you the opportunity to mix with local riders such as legend Barry Hoban, Dean Downing and Graham Briggs until the hammer goes down and then its just eyeballs out hanging onto the wheel in front. This year started unfortunately for Darren M and Ryan who ended up on the floor 20 meters after the start. This led to a split in the Fusion CC riders and meant that the plan of sticking together failed. As usual the ride involved some sections of cross winds and head winds meaning that grovelling was the order of the day. But remember, its not a race and its February. 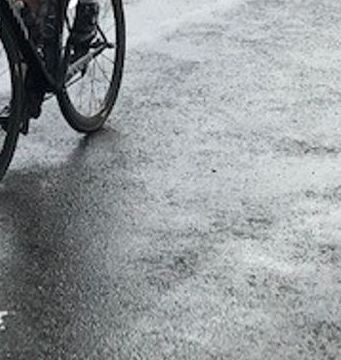 Well Done to all riders taking part in Fusion CC colours with the biggest Kudos going to young Ryan Williams who after picking himself up off the floor rode all 55 miles in small groups with little shelter and recovery time. The clubrun on Sunday 30th October saw the A group visit a new cafe at the National Stone Centre in Wirksworth (Nr Cromford). Following an invite by e-mail to visit we were not left disappointed as the "Gastro Pod" has outdoor tables, ample and safe space to store bikes as well as a fantastic view. The clubrun was a 60mile round trip taking in Youlgrave, Biggin and the climb up to Wirksworth from the Via Gelia. On the way home we decided to take in one of the toughest climbs in Derbyshire, Rowsley Bar. Average Speed for the ride was 16.5mph. Sunday 21st May saw the A group visit Langsett Café and take in the roads used by "Le Tour" and the "Tour de Yorkshire". It also gave us chance to wear our new club kit whilst climbing a total of 1,900 meters on smooth roads. The route included the climbs of Bradfield, Wigtwizzle, Ewden Bank and Midehopestones. BIG THANKS to Dan for organising the design, order and delivery of the new kit.